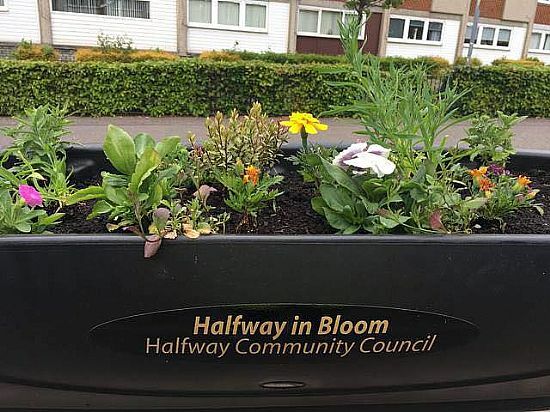 Halfway Community Council understand that local residents in Cambuslang East want to brighten up town centres. 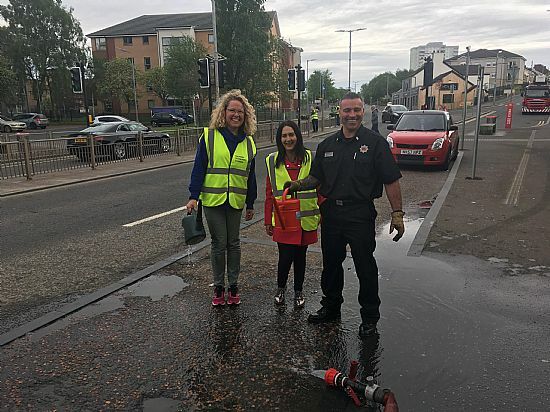 We want residents and visitors to enjoy a bit of green and colour in the main centre of Cambuslang East; to make it more attractive and inviting to visit. So far we have contacted some local businesses, clubs and organisations in Halfway and have still to talk to many more about funding planters for railings and baskets. 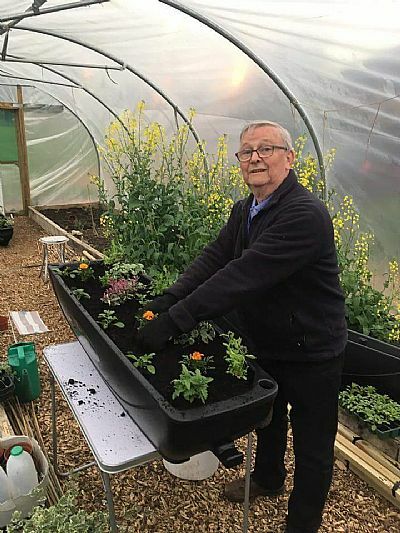 We are co-ordinating this green project with Halfway Allotment Society and Eva Burrows both of whom are kindly helping us with plants, planting and maintenance. 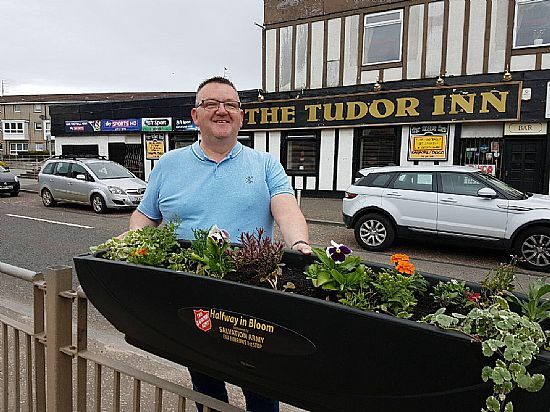 To date we have 14 large planters purchased which is fantastic and these planters are great way to promote local businesses/ clubs/ organisations as there is the opportunity to have their name engraved on the box. 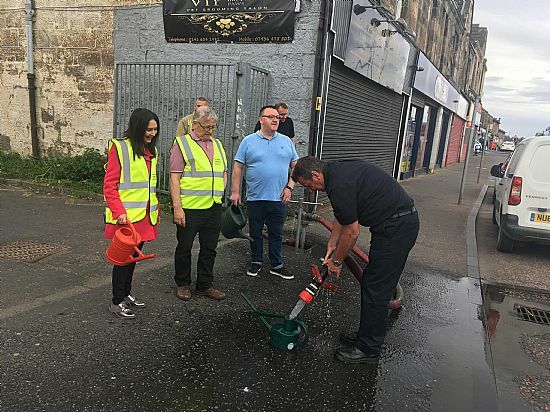 Do you know any other businesses or clubs or other organisations that would fund one of these large self-watering planters in Cambuslang East and help to make Halfway a brighter place? Sunday morning (20th May) we moved 13 large flower boxes from the Eva Burrow Centre and Halfway Allotments to the main central reservation in Halfway. 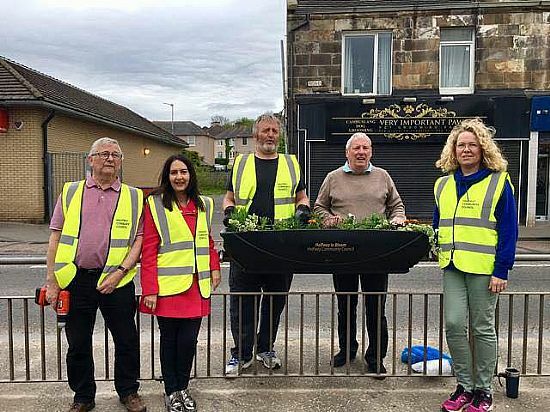 Halfway community councillors and Alan McGrotty from the Eva Burrow Centre then secured the boxes along the main central reservation in Halfway for all to see and enjoy this summer. 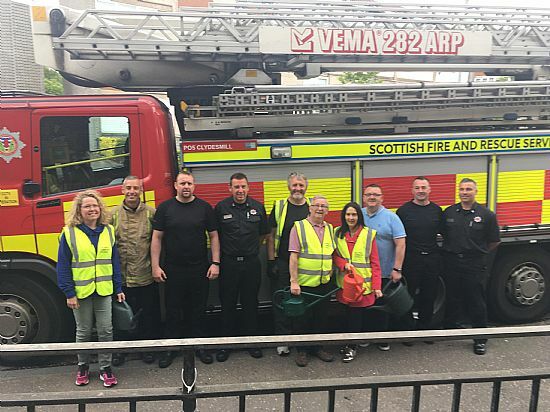 Thank you to the Amber watch of Strathclyde Fire Service – Cambuslang under the watch of Stephen McGurk who arrived on the scene to provide water for these large flower boxes. We have still got another six boxes to go out but have made an amazing start to our Halfway in Boom project.